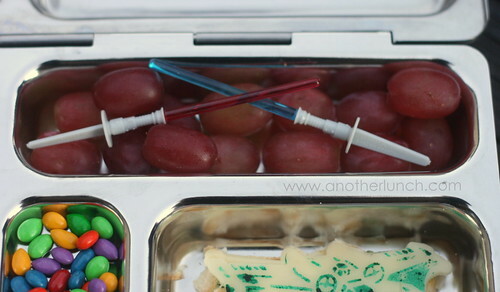 Clockwise from top left: baby carrots, purple grapes, mini quesadillas topped with Stars Wars cheese, sunflower kernels and the little treat section holds chocolate and candy coated sunflower kernels. Nope, no m&m's! That tube is being repurposed to dispense sunflower kernels. :) It's the perfect size and makes them really easy to carry and eat! The Star Wars cheese (a Storm Trooper and X-wing fighter ship ((according to my obsessed son)) is made with a set of cookie press cookie cutters from Williams Sonoma. I've had the face ones for a long time and then this past May Ethan picked out the new space ship set for my Mother's Day gift. Isn't he precious? 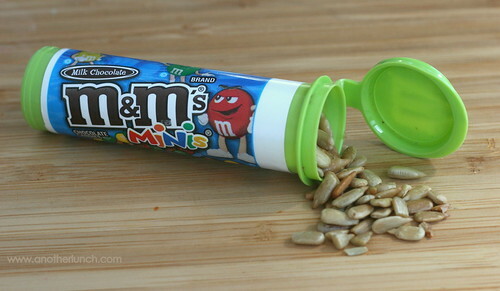 OK so, I'd have to take the label off of the M&M's container lest my child be SORELY DISAPPOINTED when she opened it. LOL Cute idea though! So freaking awesome! Where did you get the light saber "swords"? My Charlie would go crazy for those, especially since he's going to be Luke for Halloween :) Nice job as always Melissa! 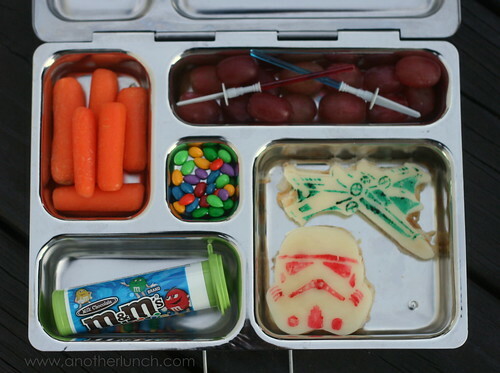 EasyLunchboxes: angry birds bento lunch! Muffin Tin Monday - Halloween!